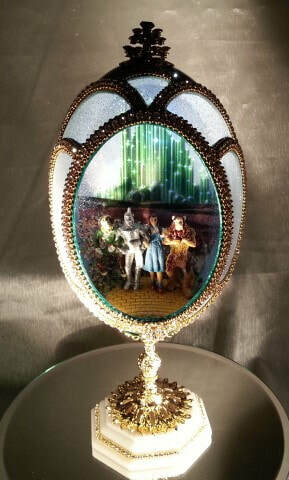 ​This charming egg captures Dorothy and all her friends on their way to the Emerald City. 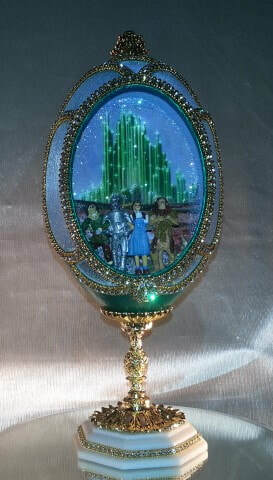 Inside we find our favorite characters on the yellow brick road as they ” Journey to OZ”. 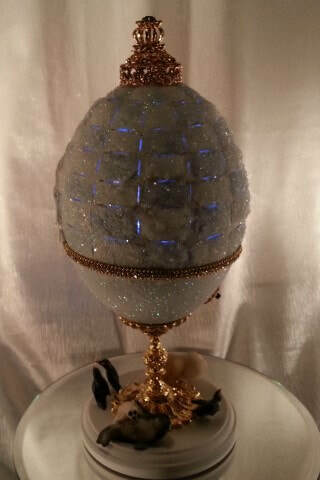 The Rhea egg is hand cut with decorative designs and adorned with Emerald organza and Austrian crystals. 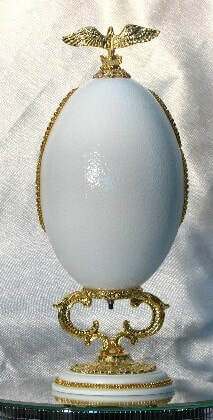 The egg is supported by a beautiful gold plated stand and decorative Corian base. 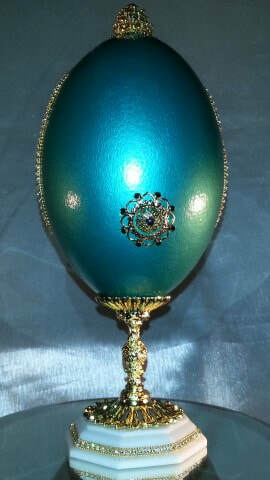 This design is finished with a sparkling emerald green Austrian finial. 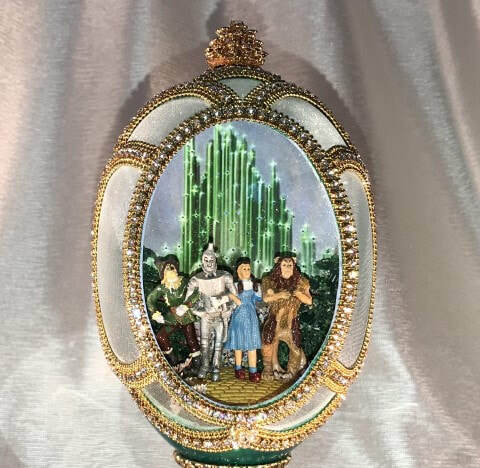 The backdrop is lighted on a 30 second timer, illuminating Emerald City. 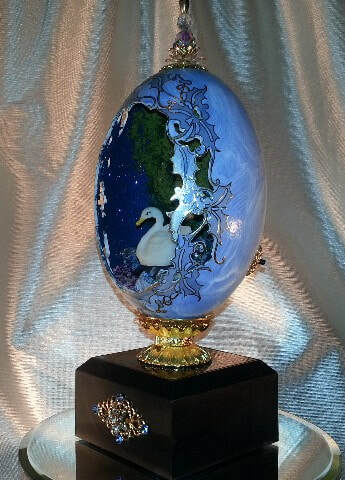 ​From Tchaikovsky’s Swan Lake ballet to the swans and swan boats at Boston’s Public Garden, the grace, beauty, and mystique of this beautiful bird has captured the imagination for eons. 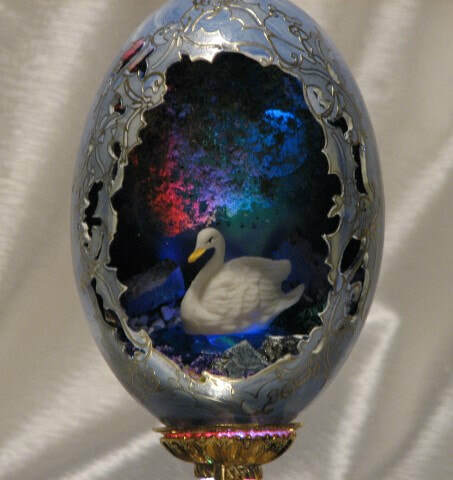 Let our swan captivate you. 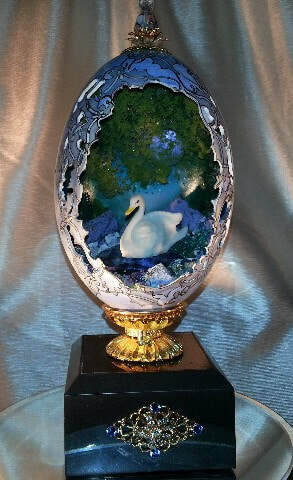 Our swan swims at night among moss covered trees and flowers on a lake in a mystical forest, illuminated by the moon and stars. 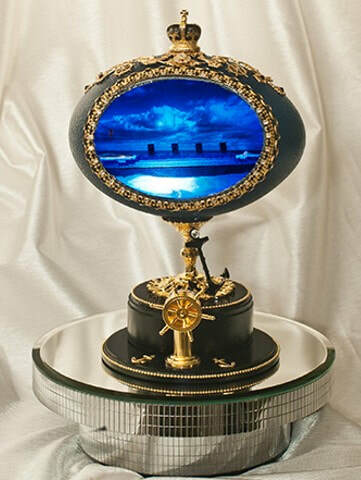 Framed by an ornated hand-cut opening trimmed with silver decal with the effect of frosted glass, this timeless scene is set in a 14-inch cut white Rhea egg, supported by a gold plated stand atop a LED four color light box. 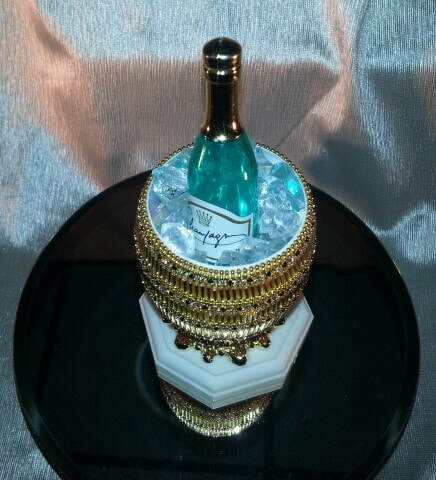 A gold finial with Austrian crystals completes the piece. 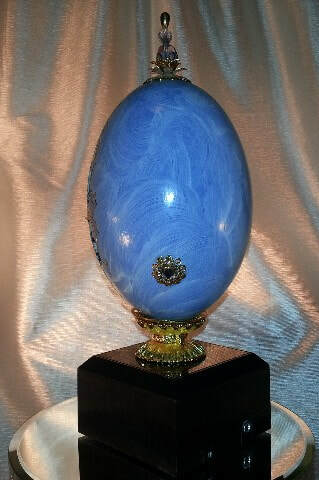 This egg has two switches to control the illumination, one on the base that lights the inside, and the back of the egg has a push-button switch that lights up the moon and stars, with automatic shut-off after 30 seconds. 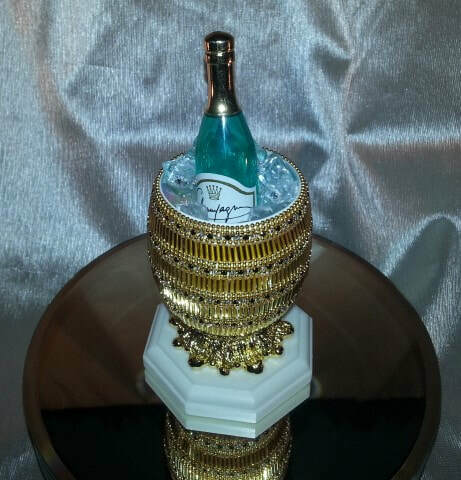 ​A goose egg cut and designed into a beautiful crystal ice bucket with champagne bottle. 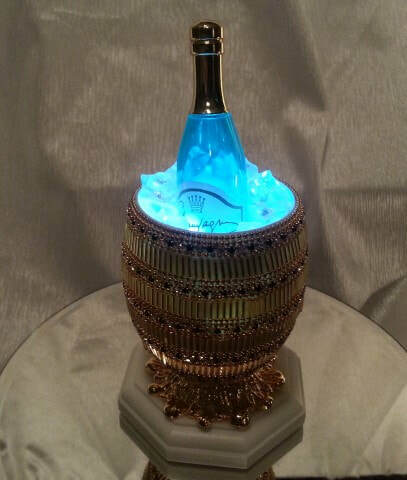 This design is illuminated, lighting up the inside of champagne bucket. 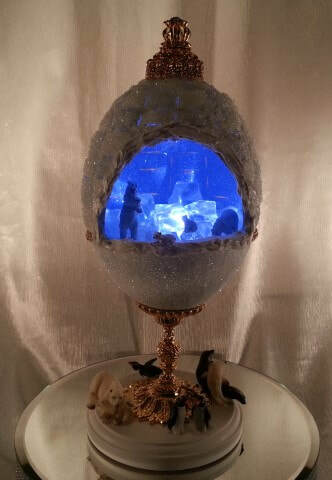 The lights are on a 30 second timer that automatically shuts off. 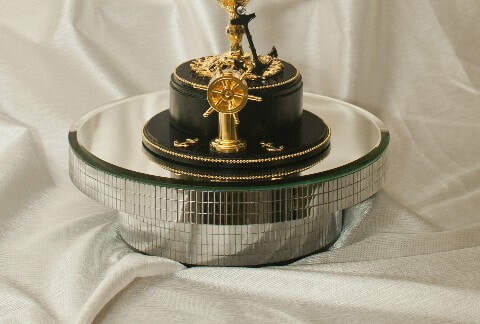 This design is decorated with black and white Austrian crystal chain and gold bugle beads and sits on a gold plated stand and corian base. 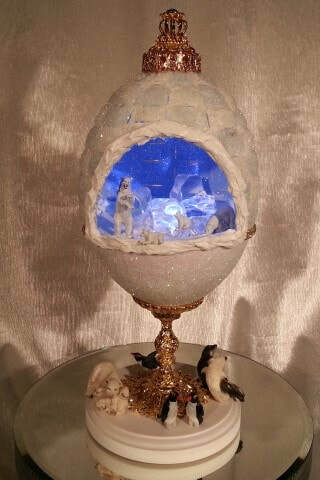 Polar Bears and friends enjoy a relaxing day in the arctic. 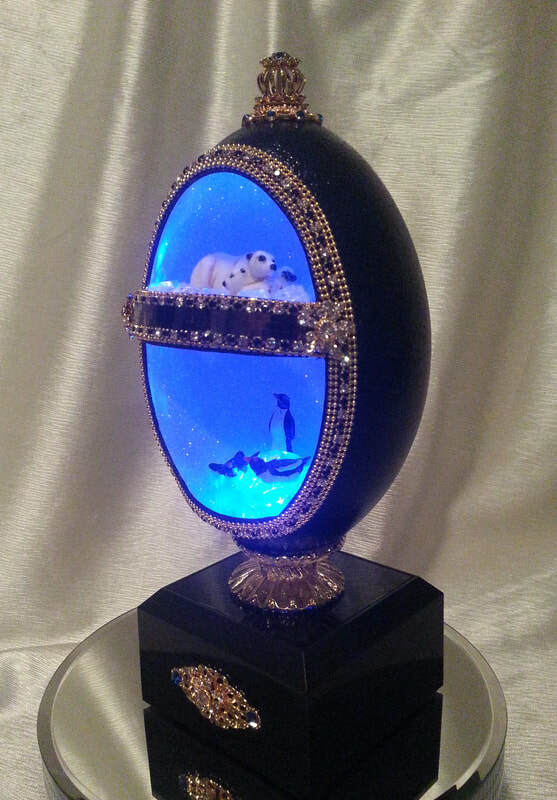 This design is lighted revealing a polar bear family inside their arctic palace with all their friends down below. 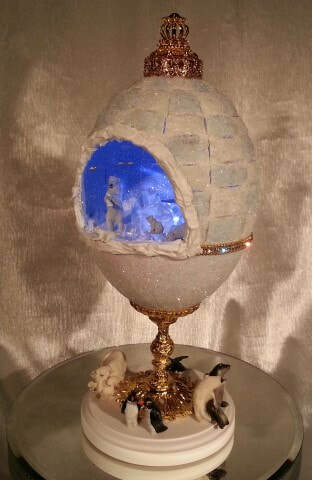 The Rhea egg is designed and cut to create ice blocks, allowing the light to shine through and illuminating the inside of the egg. 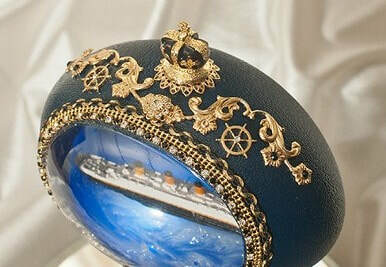 Detailed German Preiser figurines and Austrian crystal filigree are added to complete this design. 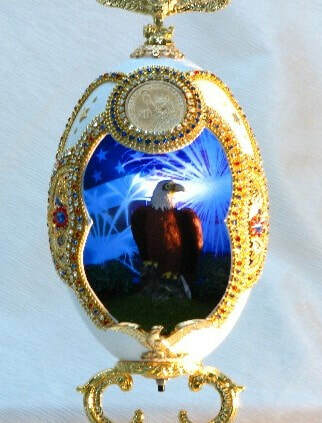 ​In a celebration of freedom and liberty, the symbol of the American eagle is captured in this wonderful new design. 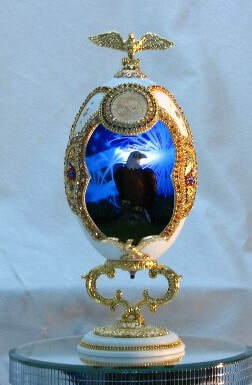 A bald eagle sits in this hand-cut rhea egg in front of a lighted flag and firework backdrop. 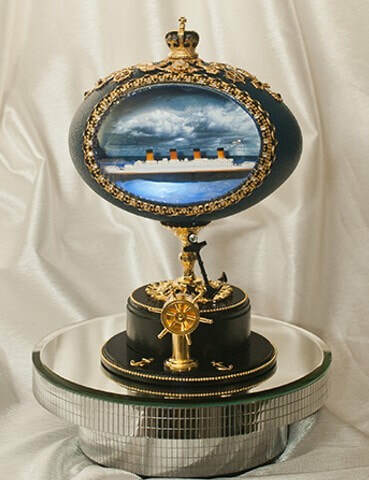 A push button light allows our liberty eagle to light up as he sits on his perch. 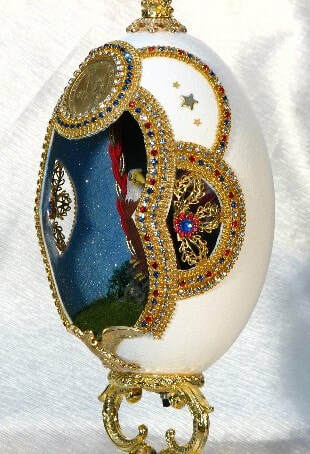 The multi color Austrian chain adds a burst of color to the cut out windows and the gold dollar coin that is embedded in the front of the egg. 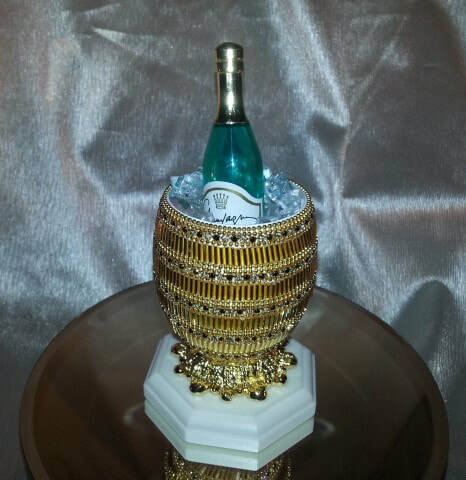 A gold plated eagle tops our Liberty egg design and is supported by a gold plated stand with decorated Corian base. 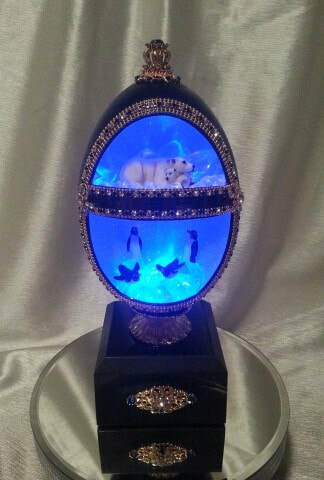 An adorable polar bear and cub snuggle playfully in the “northern hemisphere” of this midnight blue Emu egg while winsome penguins frolic on the ice flow of the “southern hemisphere” below. 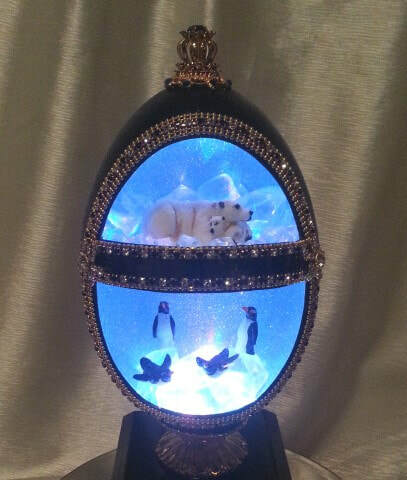 If these creatures weren’t delightful enough, their frozen playground is illuminated by a multi-colored light box that, much like the northern lights, wonderfully plays off the egg’s sparkly diamond dusted sky blue interior. 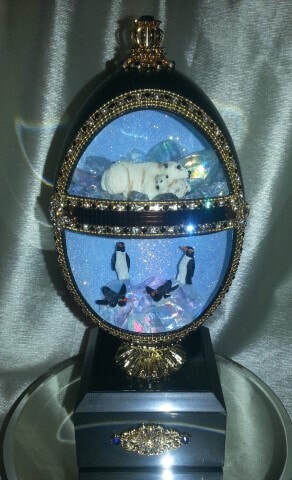 A chain of black and white Swarovski Austrian crystals frames this captivating polar world.